David T. Boddie interviews Robyn H. Snyder, Lockheed Martin MST Undersea Systems Supplier Diversity Program Manager. Federal Allies: First, I would like to compliment Lockheed Martin for doing such an excellent job this year at Washington Days Conference and for sending you Robyn because you not only keynoted Lockheed Martin’s Diversity and Mentor Protégé programs, you stayed for the entire afternoon and participated from the audience during the small business Q & A with Mentor Protégé panelists Tony Eiland of GSA and Kevin Boshears of DHS. As it turns out, at many of our events, we frequently have as much expertise in the audience as on stage. This year audience member Gary Shumaker of C2 Solutions Group was identified by at least one panelist as his mentor. So these were great conversations all around. We thank Lockheed Martin, Suzanne Raheb in Orlando, Florida, Orysia Buchan in Syracuse, New York, and your office in Manassas, Virginia, and headquarters in Bethesda, Maryland. And now for our national audience of small businesses that were not able to attend Washington Days, we appreciate you sitting down for this interview. What are your day-to-day priorities to manage Lockheed Martin Diversity? Lockheed Martin: Lockheed Martin has an extensive Diversity Program which is tied to our culture and values: Do What’s Right, Respect Others, and Perform with Excellence. Lockheed Martin is proud to support a culture which is inclusive of all diverse categories and in which all employees are respected and empowered to do the right thing, every day in every situation. Our diverse supply chain mirrors our culture and all of our suppliers are expected to adhere to our ethical commitment of doing what’s right and respecting colleagues, customers and partners to produce a positive and productive business relationship. Federal Allies: What are recent trends that you would like to emphasize from Lockheed Martin’s interactions with the federal agencies and SMEs? Lockheed Martin: Lockheed Martin, and the defense industry as a whole, continues to be faced with an uncertain economic environment. The constant trend is change in social, economic and global environments that affect the way we do business. The Defense budget is getting tighter and continued reductions are forecasted. Customer demands continue to change with a focus on increased productivity and savings to enhance performance, while reducing costs and delivering optimum value. Therefore, Lockheed Martin needs strategic suppliers to partner with in order to keep up with changing customer demands. Lockheed Martin has had great success with suppliers offering efficient, cost-cutting solutions, (such as bundling of products,) and innovative technical solutions to drive down-time and manufacturing costs. Federal Allies: As far as subcontracting opportunities are concerned, which strategic niches does Lockheed Martin depend on from small business to complement your capabilities? Lockheed Martin: Supplier partnerships are critical to Lockheed Martin’s mission success. However, the new reality is that the business environment is more competitive than ever and suppliers must have the total package. They must demonstrate a commitment to continuous improvement, quality, affordability and on-time delivery. They need to be able to define their specific capability and relate it back to how they will add value to our programs. They shouldn’t ask what Lockheed Martin can do for them; they should tell Lockheed Martin what they can do for us by offering value-added solutions. A firm’s best option is to visit the Lockheedmartin.com website and become familiar with our programs, products and services. We also have an immediate needs bulletin board where we post various requirements. Services we purchase tend to be niche expertise so be sure to define your services around your strongest capabilities, rather than a broad range. Federal Allies: What core values does Lockheed Martin strive to incorporate that you require of small business subcontractors? Lockheed Martin: Lockheed Martin incorporates the following core values: Do What’s Right, Respect Others and Perform with Excellence. These are included in our terms and conditions and we expect all of our suppliers to comply with our Ethics Standards. Federal Allies: The Federal Allies Institute recently launched a Corporate Ethics Certification program for small businesses and we have made it affordable. Corporate Ethics is growing in importance as a differentiator by federal agencies. Is there a specific program within Lockheed Martin that addresses this issue on behalf of small business Ethics certification? Lockheed Martin: Lockheed Martin has an entire internal Ethics organization which handles all ethical violations. This group has provided training seminars for small minority businesses in order to help them create a good ethical base at the level that will serve their employee base with the least costs. Ethics is not a program-by-program entity; it is an overall principal that Lockheed Martin’s culture embraces. We expect the same from any company that works with us. Federal Allies: How does one build a relationship with Lockheed Martin and one or more of its five business areas? Lockheed Martin: The first step is visiting the Lockheed Martin Website and reading all information pertaining to What We Do and Supplier information. What We Do covers lines of business and programs handled, guiding the potential supplier to the appropriate line of business. Lockheed Martin has approximately 40 small business officers who serve as advocates and help the company identify, develop and nurture an essential array of diverse suppliers in delivering top value and innovative customer solutions that provide global security benefits. These representatives also actively participate in their communities by serving on local and national boards and councils. Collectively, we attend more than 80 supplier diversity-related conferences and events on an annual basis. In addition, we recently debuted a new web solution called Supplier Wire on Lockheed Martin.com. Supplier Wire (http://www.lockheedmartin.com/supplierwire) is our new online gateway dedicated for diverse enterprises looking to do business with Lockheed Martin and the defense industry in general. Supplier Wire offers a wide range of educational resources, including free webinars, video tips, live chat sessions where firms can interact with subject matter experts from all Business Areas, and supplier testimonials designed to help small businesses learn how to do business as well as sustain and expand. Federal Allies: Are most of your subcontractors referrals? Lockheed Martin: There are some, but I would say the majority of our suppliers have formed relationships with the Lockheed Martin Supplier Diversity Liaison Officer or another Lockheed Martin specialist. The relationship building can start at a conference, memberships in organizations, both local and national, or other events. We encourage networking, not only with primes, but with other small businesses for strategic partnerships or referrals to fill requirements. Federal Allies: What are examples of where Lockheed Martin seeks to be a subcontractor? Lockheed Martin: Lockheed Martin participates with small business on the Small Business Innovative Research Program where it can subcontract with small business to assist in its research and development. Lockheed Martin also partners with small business on a competitive RFP. Depending on the size and scope of the effort, Lockheed Martin welcomes all invitations for subcontracting to small business. Federal Allies: Is there any further advice that you would like to share? Superior product and services. We expect top quality goods and service, always on-time, at a competitive price. We work in a highly competitive environment with a strong base of subcontractors. Cost-cutting and time-saving solutions. Lockheed Martin has had great success with suppliers offering efficient, cost-cutting solutions, (such as bundling of products,) and innovative technical solutions to drive downtime and manufacturing costs. Global Mindset. With the market shifting to new customers overseas, it is imperative for small businesses to position themselves to be able to compete in the global marketplace. Small businesses should understand ITAR regulations and international policies. We also encourage small businesses that are just breaking into the defense market to seek strategic partnership opportunities with other large and small businesses in the industry. This is a great way for a small business to make themselves marketable by partnering with a business with a solid track record of doing business with a prime contractor. Quality certifications: Requirements for quality certifications vary with the type of work being done. We frequently will use a supplier only if the company is ISO 9000 certified, though for most work we require AS 9100 or AS 9120 certification. For IT services, CMMI level 3 or 5 certification is a frequent requirement. Distributors of parts are required to be franchised or authorized by the manufacturer. Federal Allies: Many small business subscribers of Federal Allies News are in your database and meet regularly with Lockheed Martin at trade shows. If 10 firms focus on the same technologies, for example, what is the determining factor – what differentiates prospective subcontractors from one another? And what makes one company the best? Lockheed Martin: Suppliers are selected on the basis of a firm’s ability to satisfy Lockheed Martin requirements, which include quality, price, delivery and continuity of supply, capacity and reliability. These are enhanced by certifications, past performance, awards and other discriminating factors. Suppliers must be aware that Lockheed Martin has a strong base of known suppliers and competition is intense. Federal Allies: Recently FEMA looked to a high school student in Maryland to purchase a technology solution to aid their work during the aftermath of Superstorm Sandy. In our research we learned that across America there are 42,000 high schools and that only 2,250 teach STEM. This Maryland high school was one of them. 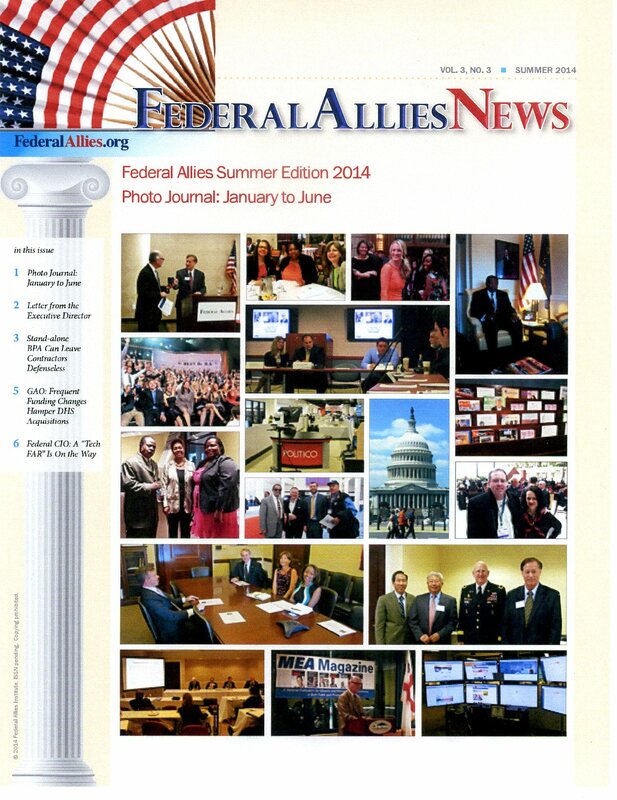 As a result, Federal Allies Institute expanded our scholarship program to include students. Many universities and The Washington Post are helping us to reach out. And this year recipients included two students from Howard University. Could you give our readers an idea of the scope and nature of Lockheed Martin’s scholarship and internship programs, how you communicate these programs, and how many lives are touched each year? Lockheed Martin: At Lockheed Martin, we support a diverse group of organizations focused on education, specifically science, technology, engineering, and mathematics (STEM) education. These organizations offer a variety of scholarships to children across the country. In addition, we also offer the children of our employees the opportunity to compete for a National Merit Lockheed Martin Academic Scholarship, which is available to 100 children per year, and we promote this opportunity through our internal and external websites and in employee newsletters. Lockheed Martin’s Intern/Co-op Program will touch close to 800 students this year. Intern/Co-op hiring is part of the corporation’s workforce planning and allows for the corporation to build a pipeline of entry level talent early on in the recruitment process. This positions the corporation to recruit and retain best-fit talent in majors of interest to Lockheed Martin. The corporation places strong emphasis on providing students with meaningful work assignments related to their specific field of study. This gives students an opportunity to apply principles learned in the classroom to the real-world environment, building engineering and business problem-solving skills. Federal Allies: On behalf of our members and entire readership, we appreciate the opportunity to help Lockheed Martin celebrate ‘100 years of accelerating tomorrow’ and look forward to talking with you again in the future. Thank you. David T. Boddie is Founder and Executive Director of the Federal Allies Institute, former Chairman of U.S. Small Business Administration’s Washington Metropolitan Area District Advisory Roundtable and Director of State and Local Affairs for SBA’s Office of Advocacy. A former executive at trade organizations in Oklahoma, Arkansas, and Maryland he worked as strategic planning executive for a Virginia small business start-up of 40-employees and worked for an international technology federal contractor headquartered in Pennsylvania. He has served Presidential administrations, federal agencies and nonprofits as a volunteer since 1982 including Judge for National Small Business Week, Class Advisor for the U.S. Chamber’s Institutes for Organization Management, State Delegations Facilitator for Presidents’ Summit for America’s Future directed by General Colin L. Powell; and Desert Storm Homecoming Foundation. 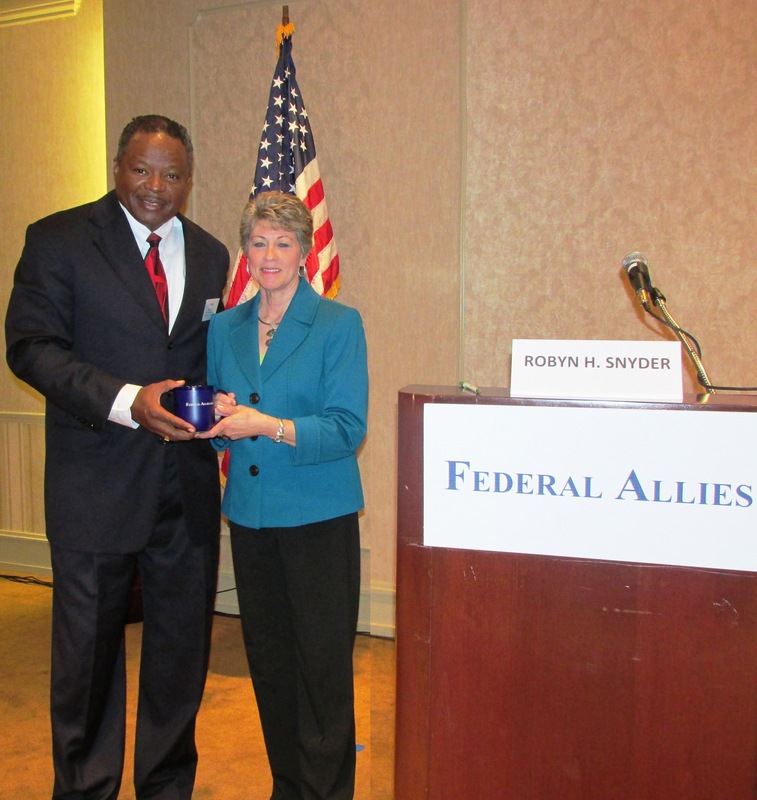 Federal Allies Institute recently convened a federal contracting conference of many of the nation’s best entrepreneurs, primes, subcontractors, associations and federal agencies. They discussed federal contracts, established relationships, best practices, and ways to spend less on back office operations. Keynote speakers Dr. Winslow Sargeant, Chief Counsel for Advocacy, U.S. Small Business Administration; Kevin Boshears, Director, OSDBU, U.S. Department of Homeland Security; and Ludmilla Parnell, Director of Business Development, Small Business Partnerships, General Dynamics Information Technology worked diligently well beyond their Q&A sessions to help America’s Small Business Community at the Federal Allies Institute conference. General Electric Company’s proactive offer to host the Monday night Washington Days Reception was yet another generous endorsement of GE for FAI and the Federal Allies Network. We appreciate the exemplary assistance of many of the participating agencies and exemplary federal employees such as Daisy Matthews, US AID; Marie A. Wright, IRS; Rocky Newton and Cynthia Adonoo, National Park Service; and Claudia Barrera, MBDA Federal Procurement Center; Kristi Wilson and Melanie Carter, US Department of Education; Barbara B. Mitchell and Richard Pihl, National Science Foundation, and Kenneth L. Mitchell, MICC, Fort Belvoir whose hard work and dedication to small business helped enable the establishment of Federal Allies Institute. Washington Days Conference is unique and compelling because it is more about establishing relationships with new colleagues and learning from successful federal contractors than it is about simply being introduced to federal agencies. All occurs at the conference, but Federal Allies Institute’s mission to help all small businesses succeed at federal contracting, regardless of their levels of maturity, was on display, as too was the effective reach of the Federal Allies Network across America to find and recruit new businesses to become federal contractors thereby helping federal agencies to meet goals for inclusion of small business and diversity in federal contracts. All conference registrants receive annual memberships in Federal Allies Institute and an opportunity to utilize the Federal Allies Network for one year following the conference. No matter where they are located… Anchorage Alaska, Junction City Kansas, East Syracuse New York, Princeton New Jersey or Waynesville North Carolina, the Federal Allies Institute pledge is to stay with them long-term after the conference in order to help them succeed in federal government contracting. The two-day conference also includes important meetings on Capitol Hill with U.S. Senators, U.S. Representatives, Committee Staff and other senior personnel to advocate for pro small business legislation. We wish to thank U.S. Sen. Pat Roberts (Ks); U.S. Sen. Jerry Moran (Ks); U.S. Rep. Gerald E. “Gerry” Connolly (Va); U.S. Representative Jeff Fortenberry (Ne); U.S. Rep. Sam Graves (Mo), U.S. Rep. Emanuel Cleaver, II (Mo); David H. Hallock, Jr., Deputy Chief of Staff / Legislative Director, U.S. Sen. Mark R. Warner (Va); Barbara Kasoff, President & CEO and Co-Founder, Women Impacting Public Policy, San Francisco, Ca; Ann Sullivan, Madison Services Group, Inc., and Director, Government Relations, WIPP; Bob Hesser and Joe Wynn, board members, VET-Force; Andy Gibbs, President, Veterans Business Institute, Palms Springs, Ca; Emily Murphy, Senior Counsel, House Committee on Small Business; Alisa Wolking, Legislative Correspondent, Congresswoman Ann Marie Buerkle (NY); and Faye Powers, Legislative Assistant/Scheduler Roscoe G. Bartlett (Md), and 105.9 FM WMAL 630 AM. On behalf of Federal Allies Institute I wish to recognize and commend the FAI Washington Days Planning Committee: FAI Board Chair Frank Clay, Jr., FAI Vice-Chairs Raymond F. Goodrich and Michael Matechak and leadership support provided by Gary Shumaker (May 14) and Ralph E. Winnie, Jr. (May 15); Wayne M. Gatewood, Jr. USMC-Ret. , and Rick Cutrera of American Airlines. Additionally, Daniel R. Caffoe, Kevin Hailstock, Todd Myer, Cynthia Richardson, Alex Saidii, Patricia Driscoll, Andrea Gagne, Mary Cowell, Jared Stearns, and Lee Dougherty. Congratulations to scholarship recipients Colleen LaTray, Loretta S. Hickman, and LaFarris Risby. We trust this conference made a difference for you! We look forward to working with all participants.